One game I've secretly had a desire for, for quite some time, is Jumpgate Evolution. Growing up a PC gamer I spent countless hours with games like Wing Commander, X-Wing and Tie Fighter series. The space combat genre had all but disappeared, but recently is making a resurgence. A realtime space combat MMO, Jumpgate thrusts players into a gorgeous - and I do mean gorgeous - universe. The game was supposed to hit beta last year, but Scott Brown, President of NetDevil, told me that they just weren't happy with where things were in their smaller internal betas. They had decided to take some things back to the drawing board, tweak and add some features, and now a year later Netdevil is gearing up for a public beta again. The game has players joining one of three factions, and while we weren't given the story, we're told that the first part of the game gives players clear defined roles and background on the war at hand. In fact, we were told it's not uncommon to see huge battles going on when jumping into different areas. But these aren't humans battling, this is the AI fighting for control. I got to see one such battle on the floor, and Scott seemed a bit surprised at what he saw. "Huh, last time we were here the reds were clearly winning, but it looks like blue has turned the tide a bit." 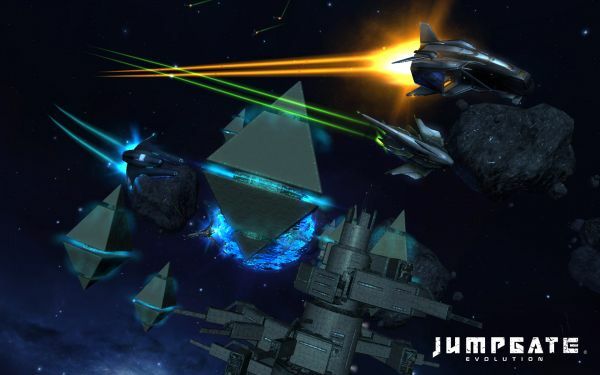 Space may be big and black in our heads, but Jumpgate is anything but. Beautiful greens, blues and reds adorn the skies of Jumpgate. Stars, nebulas, and planets pop off the screen as you explore the universe around you. One goal Netdevil had with the game was to make sure that everything didn't feel particularly empty, and that each area had a purpose. We finally got to see an epic battle with a huge space station, one of the boss like creatures in the game. The stations are so huge players are able to get down to the base level and weave in and out of structures on it to avoid attacks. Imagine something like the Death Star run. We watched as the demo weaved in and out of structures to avoid incoming enemy fire and finally hide and hover behind some buildings. All of this was controlled with the mouse and keyboard in real time, no point and click action. Suddenly he burst out and was taking down enemies in one shot. "Did you turn on the admin cannon?" asked Scott. "It's too much fun not to cheat with it." replied the person playing the demo. With over a quarter million beta sign-ups already, Jumpgate is going to be an extremely popular game. If all goes according to plan we should see a release early next year and hopefully a beta this year. Page created in 0.6046 seconds.